Thanks. Very nice theme. Your web site is very beautiful. Thank you very much for another amazing theme! Thank you for making and sharing this theme w/ us. I love it! Thank you for this beautiful theme and also for making web publishing possible for design-challenged people like me! One of the best WP theme designs I’ve seen! Hey its really nice…but could you help me…when i place the main background the image is upside down … what can i do? 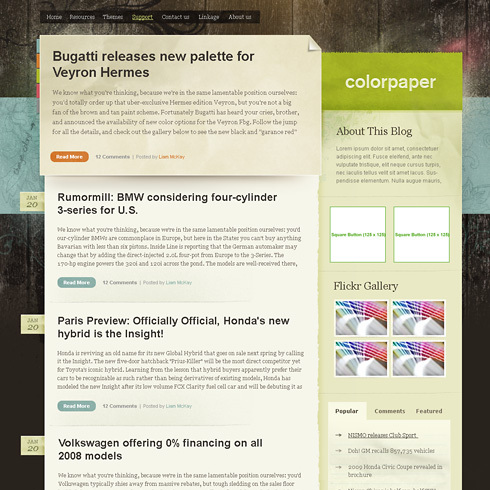 Thanks so much for a great Color Paper Theme. Sorry I think I got it fixed now. Thanks again for the awesome theme.